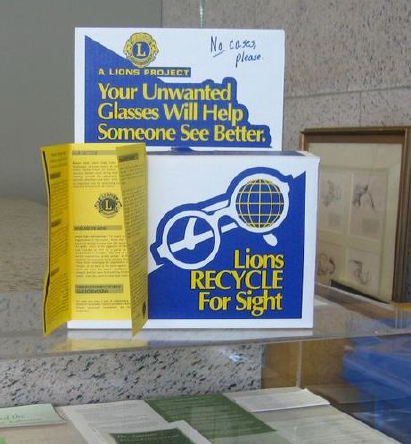 The Lions Recycle for Sight program is the Denver Den's name for the famous eyeglass collection service that Lions Clubs International has done for years. We collect used eyeglasses. They are taken to facilities where they are cleaned and the prescriptions are read. They are then made available to missionaries and others going to other countries where eyesight care is lacking. You can find eyeglass collection boxes at just about any optical store and many medical facilities. In addition, many churches and other locations participate in the program. Because it is not legal to provide prescription glasses to folks in the US, this program does not benefit US citizens, and we are also not able to provide a donation receipt for your gift. 32 Denver Lions collect from 100+ boxes and accumulate approximately 100,000+ glasses donated per year. Glasses are used for international missions.